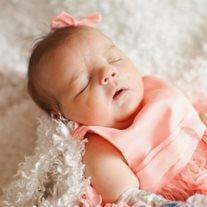 Mettie Skye Tingey, 26 days old, of Mesa, Arizona passed away in her home May 9, 2014 in Mesa. She taught us about the important things in life in her short time on earth. Visitation will be held Saturday, May 17, 2014 at 8:30 AM, at the LDS Mountain View Stake Center, 1550 N. Val Vista Drive, Mesa, AZ 85213. Funeral Services will follow at 10 AM at the same location. Mettie will be buried at the City of Mesa Cemetery following the funeral services.